What do you do when you lose one of your founding members? Well, if you're Norwegian avante-improvising group Supersilent, you continue on, almost as if nothing has happened. Not that the loss of drummer Jarle Vespestad wasn't felt; it's just that, for Supersilent's remaining membersArve Henriksen, Ståle Storløkken and Helge Sten (aka Deathprod)the needs of the many far outweigh the needs of the few. The group's first performance as a trio was at Molde 2009 and, with Henriksen spending as much (if not more) time behind a drum kit, it was clear that Supersilent's distinctive marriage of jagged, ear-shattering noise and beauty found in the most unexpected places remains not only intact, but moving ever- forward. Still, what the trio would do for its follow-up recording was anyone's guess. 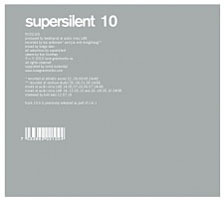 Clearly the group could continue on in the same general direction, but despite over a decade behind it, Supersilent constantly searches for new approaches, new means of expression. When German radio journalist Michael Engelbrecht mentioned, at Punkt 2009, that the next Supersilent disc would find its three members on nothing more than Hammond organs, it was difficult to know whether it was a joke or not. It wasn't. With next to no information and its four long tracks titled numerically as always"9.1" through "9.4"9 finds Henriksen, Storløkken and Sten exploring the vaster reaches of the venerable Hammond organ, taking it places that no band has gone before. Of course, this is Supersilent, so sound processing, both real-time and in post-production, are de rigueur. Even with the near-infinite possibilities afforded by the instruments' multiple stops, the trio creates soundscapes its inventor, Laurens Hammond, could never have envisaged. 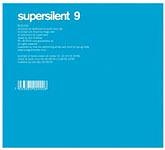 If 8 (Rune Grammofon, 2007) contained some of Supersilent's most beautiful music, then 9 surely contains some of its darkest. Four tracks, ranging from 11 to 14 minutes, explore blended sounds, pulses and jagged noise, yet the sum total is something out of a deep, dark nightmare, even though there are brief moments of respite. Less sonically denseat least, most of the timethe group has also achieved a longtime goal: complete anonymity, where the music speaks for itself, with no titles to define it and no information on the CD to describe it. 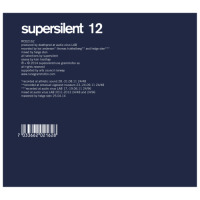 In the past, at least, it was possible to discern specific players with their primary instruments, but here Supersilent truly becomes that most faceless of bands, one where the only way to know who is doing what would be in performanceand, even then, it won't always be clear. 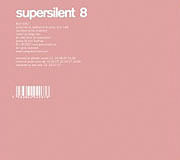 With 9, Supersilent goes to a brooding place informedas much by the dissonant landscapes of contemporary organ works by György Ligeti as it is anything in the jazz sphere;, music felt, rather than heard in conventional terms such as melody, harmony and rhythm. All three surface periodically on 9, but only as part of a larger improvised audioscape which, stunningly imaginative, makes clear that Supersilenteven pared down to a trioremains committed to pushing the envelope of sonic exploration forward, even with such seemingly reductionist instrumentation. Track Listing: 9.1; 9.2; 9.3; 9.4. Personnel: Arve Henriksen: Hammond organ; Ståle Storløkken: Hammond organ; Helge Sten: Hammond organ.